Some CRS and plain clothes cops are posted at the end of the pedestrian street. We set ourselves up anyway, some music, a few banners and little by little we are about 250 people. 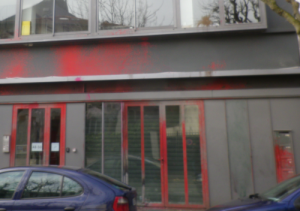 Talks are linked (why this demo, the Bara collective, a short account of the story of Alfidel, on the occupation at the University of Paris-8, the Gambetta collective, …). 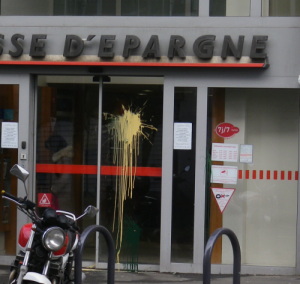 Shortly after 19:30, the demo sets off towards the rue de Paris and the market, slogans, songs, leaflets given out (call to the demo, Prison for nobody, communiqué of detainees of Fleury-Mérogis, call for the support evening of the Baras collective), flyposting, tags, paint eggs. 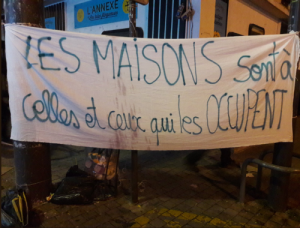 The demo is rather well received in the street, we stop next to the Dufriche market from where the town hall has expelled Roma installed there several times, then in front of the Bara homes which is being closed slowly, where more habitations are regularly walled up. Another stop in front of the architectural firm Archi5 which participates in the construction of prisons (in particular Condé-sur-Sarthe and Vendin-le-Veil) … Slogans against jail are shouted and we leave along the rue de Paris in the other direction, doing tags and throwing paint eggs mainly on real estate agencies and banks. 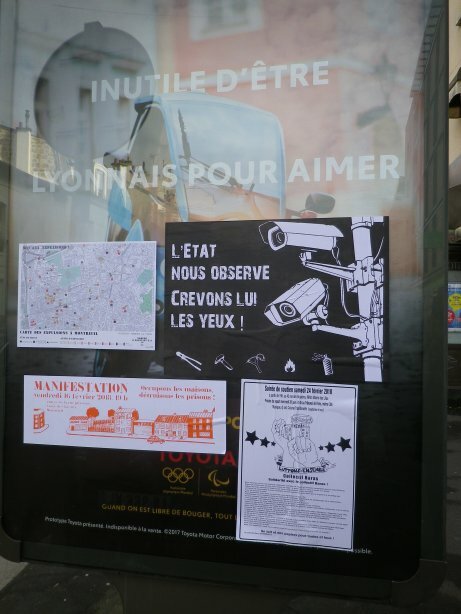 In this district, where some sordid news item serves as a pretext for the town hall to reinforce CCTV surveillance, posters calling to sabotage the cameras were put up. Behind the procession, we realize that four teenagers are being controlled by the cops. The demo turns around and confuses the latter, making them give up their control and leave rapidly. A first fireworks is set off and we go back to the rue de Paris … A second lightening up at the roundabout of Croix de Chavaux. We take the boulevard Rouget-de-Lisle, the street of the banks and estate agencies. 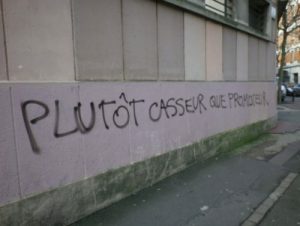 The aerosols are always full to say what we think of all these agents of gentrification and capitalism! A few songs later, we reach the town hall of Montreuil, glad to have taken the streets for two hours, without negotiating the demo taking place or its course with the cops and without hiding our intentions or our ideas. [Translated by Act for freedom now!